Rent villas and apartments in Le Barroux, the South of France with private pools. This 5 bedroom house with private pool is located in Le Barroux and sleeps 9 people. It has WiFi, air conditioning and a garden. 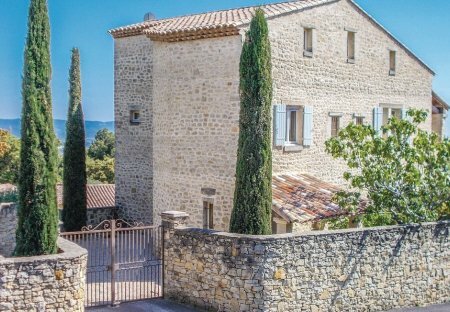 This beautiful five bedroom villa is situated in the pretty village of Le Barroux, within easy reach of some of the most beautiful sites of the Vaucluse. Located in a beautiful mountain village overlooking the famous vineyards of the Ventoux, this apartment is very bright. You can not resist the authentic charm of this holiday rental, charming stone house at the foot of the Château du Barroux. This is a large village house in a quiet and charming mountain village. The main attractions are the Lac du Paty, Vaison-la-Romaine, Carpentras, Orange and Avignon. Close to the legendary Mont Ventoux, this charming vacation rental offers great views from its windows and has a lovely terrace sheltered from the wind and sun. Enjoying panoramic views over the village of Le Barroux and the majestic Mont Ventoux from its hillside perch, this modern, single-storey property is ideal for couples seeking a tranquil holiday.